Paramedics are usually the first to respond to accidents or emergencies. They arrive by ambulance and they're highly trained medical professionals with the knowledge and experience needed to properly assess the patient's condition and administer necessary treatment. Though the image of paramedics rushing to the scene and saving lives is often the first to flash through people's minds, paramedics can do many other things with their education, training and skills. 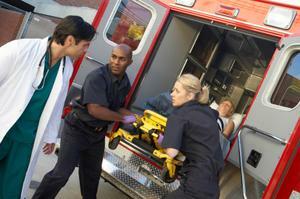 Ambulance paramedic: The majority of paramedics work on ambulances. Their work involves responding to emergencies, assessing patients and administering potentially life-saving or stabilizing treatments and transporting them to critical care medical facilities. Flight paramedic: This is a competitive career field. According to the International Association of Flight Paramedics, for each job opening, there are 250 applicants. You won't be arriving at the scene of an accident in an ambulance-you'll fly in on a helicopter. Patients in need of flight paramedics are often severely injured or ill, in need of faster transport to an advanced care facility. This could be a much more stressful-yet highly rewarding-career for a paramedic with a few years of experience on the ground. Remote duty paramedic: With this type of career, you're on-site and in charge of the health of people at a specific location. In some cases, you'll need additional experience in other fields for this type of career. For example, working in offshore locations in Alaska with In Place Medical Solutions will require experience in extreme cold medical care. There is also a preference for paramedics who have experience in the gas and oil industry. There are similar careers available that involve working in prisons and other remote locations, sometimes internationally. For individuals living in these locations, a trip to the doctor or a long trek to the hospital could prove dangerous or impractical. Remote duty paramedics consult with doctors via video conference in order to treat patients. Managers, supervisors, and directors: An individual with years of experience as a paramedic could be eligible for a management, supervisor or director position within a hospital or clinic at home or abroad. For example, U.S. military bases in other countries need supervisors to manage their EMS systems. Instructor: Someone has to teach and train EMTs and paramedic students. A paramedic instructor can create and implement the instructional plans they feel will prepare students for this stressful and important position. According to the Bureau of Labor Statistics, the employment opportunities for paramedics are expected to grow at an average rate through 2018. Some of the growth is due to the need for replacements for volunteer EMTs and those who leave because there is no more room for career advancement. BLS.gov also cites that more time is needed per patient now due to transit time and the overcrowded emergency facilities. Careers for paramedics can offer both stress and excitement whether you take the traditional route and rush to accident scenes in an ambulance, you fly in on a helicopter or you take advantage of new technology and work at a remote location. If that sounds too stressful, there are quieter paramedic careers, like working as a paramedic instructor, but to get to those positions you'll have to put in years of traditional paramedic work. Just remember, working as a paramedic doesn't always mean being the first at the scene of an accident - there are other options within the field.